The regal Persian is a long-haired cat breed with a heart of gold. These affectionate cats are immensely popular as both companions and competitors. 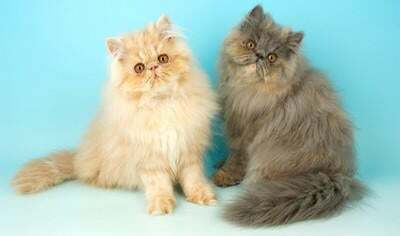 It’s easy to understand their celebrity status when you consider not only the Persian’s quiet and calm demeanor, but also their variety of eye-catching colorings and features that we are naturally drawn to such as large eyes, and their characteristic majestic coats. Whether you’re hoping to adopt a feline friend or are just curious about the breed, you can read on more about the Persian perfection below! Information about the Persian cat breed’s history is largely unavailable before the 1600s, but it was around that time that an Italian traveler named Pietro della Valle brought the Persian back to Europe, where they steadily gained popularity. In the 1800s their status skyrocketed and, in the latter part of the century, North Americans joined in admiring the Persian. In terms of temperament Persians are very loving and calm. They tend to be less active than other cats and may not show as much curiosity about their surroundings as another cat would. While Persians love their human companions dearly and, in fact, don’t do well when left alone for long periods of time, you’ll want to be careful about introducing children. Only gentle children who aren’t prone to sudden movements will suit the Persian’s fancy. Canines may be welcomed by the Persian, but it depends on both parties’ ages and, again, energy level. If a dog is rambunctious and never out of energy then the Persian may not be as keen on canine companionship, whereas if the dog is also mellow then they may form a strong bond! Physical descriptions of the Persian tend to include features such as “a round head, short face, snub nose, chubby cheeks, small, rounded ears, big eyes, and a sturdy body.” Breeding for some of these characteristics has resulted in a tendency toward certain health issues, particularly having to do with the short face and snub nose. Understandably, this beloved breed of cat frequently experiences breathing difficulties, so if you’re interested in bringing a Persian home be aware of this complication and consult your vet during your Persian’s initial and annual examinations. It’s unsurprising too that Persians are typically heat sensitive because of their long, luxurious coats. Be sure that you can provide a temperature-controlled environment before bringing home any pets who are especially heat or cold sensitive. Don’t forget to keep those nails trim and those teeth clean, either! If and when you find the right Persian to give a forever home to, be sure to call NOVA Pets at (703) 378-9791 to arrange an examination, and don’t forget to check out our wellness plans that take care of your pet’s health care needs for an entire year! You only pay a monthly rate for the year instead of paying up front every appointment. They also include additional discounts so be sure to check them out.